You might have noticed that The Daiquiri Whacker cost much less than any other gas powered blender on the market. The Daiquiri Whacker was engineered from the start to be mass produced. This helps to minimize assembly labor and parts costs. The blender comes to you fully assembled, ready to go! The Daiquiri Whacker sports the new Homelite 26cc Mighty Lite™ engine that produces the most horsepower in its class. Homelite has the patented Zip Start™ technology – Twice as easy to pull, quicker to start. *NOTE* Pictures show the old motor style. New pictures soon! The top of the Daiquiri Whacker acts like an umbrella to protect the motor from any spillage. Cleanup is easy! Just wash the jar and wipe off the base. The motor stays VERY clean! 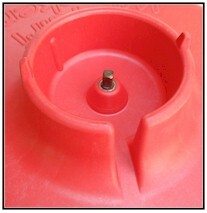 The receptacle in the center holds any Oster Jar and is slotted in the back to allow an escape path for any spills preventing any liquid from seeping into the motor. 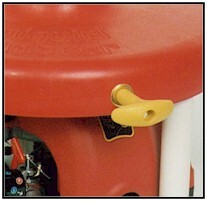 The starting cord , choke, and engine kill switch is located right on the front of the motor. Easy to find and easy to start. The three heavy duty PVC legs press right into the base and provide a tripod footprint that won't rock on any surface. The Daiquiri Whacker was designed to use Oster Jars because of their metal-on-metal coupling to the motor. (not the rubber claw) This is the most reliable system available. We use Oster's Ice crushing blades, Oster lid, and Oster base. 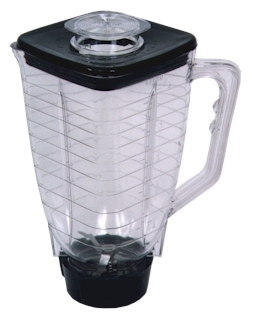 The blender jar we supply is guaranteed unbreakable. They cost us a bit more, but it's the best jar on the market!